My niece has been busy again with the Magnolia images. This week she wanted to do the Magnolia Down Under Challenge. The challenge is ‘Winter is Here’. Quite appropriate for this time of year, although our weather for the past few days has given hints of spring. Unfortunately, I don’t think this will last. Anyway, Catherine has put in a wonderful effort with this one. Don’t you agree? She had a busy afternoon, also making another Tilda card. Again, a great effort. Well done Cat. Hopefully, I will get to show some of my own in the next few days. She has down a super job! Thanks for joining us at Magnolia Down Under! 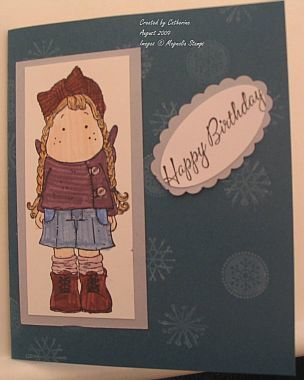 Gorgeous card, thanks so much for playing along and joining us at Magnolia Down Under Challenges. Hope to see you back again next challenge. Catherine, wonderful cards. You’ve done a great job with both cards. Keep on card-making! Really cute cards – Catherine has done a fabulous job!